Harrington was one of Thomas Bjorn's five vice-captains as Europe regained the Ryder Cup with a crushing 17.5-10.5 points win at Le Golf National in Paris on Sunday. 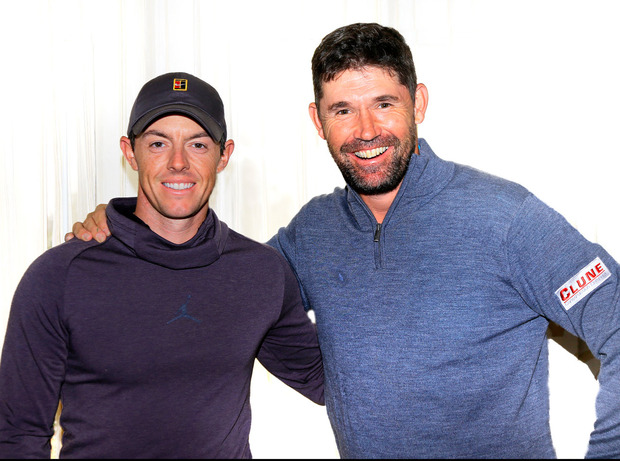 "I've always thought Padraig would be a good captain in the United States," McIlroy said. "He's won a lot of golf tournaments over there, he's won a PGA Championship. "I think the continuity in the European camp having all these vice-captains this year and preparing for captaincy down the road has been a huge foundation of why we've been so good. "No matter who the captain is next time they'll be ready and I'm sure they will do a great job." Harrington, 47, is a three-time major champion - having won two Open Championships and one US PGA title - and played in six Ryder Cups between 1999 and 2010. And McIlroy revealed that captain Bjorn's proposed tattoo to celebrate Ryder Cup glory could be extended to cover the names of the 12-man team. Bjorn has agreed to get Europe's winning score tattooed on his body, calling it his "worst decision of the week". Four-time major champion McIlroy told Sky Sports: "Thomas said in one of his team meetings earlier this week that if we won this Ryder Cup he would get the score tattooed on his behind. "But we wanted him to get the score on one cheek and the list of players on the other cheek, so we'll see if that happens." The fall-out from the Americans' defeat saw Patrick Reed admit egos were a problem for them, and the Masters champion blamed Jordan Spieth for the end of their successful Ryder Cup partnership. Reed, the man called 'Captain America' after previous Ryder Cup successes, also claimed it was "not smart" of US captain Jim Furyk to leave him out of two sessions. "We can't really speculate on what was going on in there, we just had to worry about what we were doing," McIlroy said. "I think they (Reed and Spieth) had only been beaten a couple of times in Ryder Cups and Presidents Cups. "But the golf course might not have suited them, it might not have set up great up for them. "They've done well before, they've been a great partnership, but at the end of the day the players have to be good enough to win their matches. "The Europeans just did that a bit better than the Americans this week."